BREAKING NEWS: The Molly Lauman Service Center will be closed on Monday April 22, 2019. The Girl Scout Research Institute conducted national research for a look into girls' digital experiences and their use of technology to lead in their own lives and beyond. How are today's girls using technology to improve their lives, their communities, and the world? Read more to explore the findings and learn ways you can support today's digital girl. Is your girl Kindergarten ready? Your girl is heading off to kindergarten soon- are you ready? Girl Scouts can help! We know this is an exciting time as your girl approaches another big milestone. 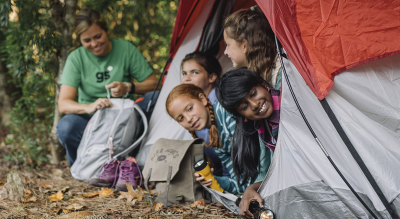 With so many new experiences to conquer and lessons to learn, a trusted partner and all-things-girl expert like Girl Scouts is exactly what your girl needs to succeed in and out of the classroom. Text DAISY to 59618 to have valuable tips and activities emailed to you or visit the link below. The four members of Troop 977 know the importance of teamwork.